Is there any authoritative rubric for the Extraordinary Form that requires statues and crosses be veiled in Church, or is it simply customary? Our Extraordinary Form community is domiciled in a location that does not currently veil, and doesn’t seem inclined to do so. The custom continues in the Novus Ordo. But it is more than a custom in the Usus Antiquior. It is necessary. The 1962 Missale Romanum has a rubric which prescribes the veiling of images. If memory serves, the instruction is also in the rubrics for the Breviarium Romanum and the Caerimoniale Episcoporum. This isn’t “may” be covered. It is “are” covered. This entry was posted in "How To..." - Practical Notes, ASK FATHER Question Box, Liturgy Science Theatre 3000 and tagged Passion Sunday, veil images. Bookmark the permalink. 2 Responses to ASK FATHER: Must images be veiled from Passion Sunday or is it only an option? OF Parishioner: Hey, Father, what’s up with the crosses and statues being covered up? Faithful Pastor: Well, it’s required in the EF Mass that I celebrate at our parish every Sunday and Holy Day of Obligation, and rather than unveil and reveil them depending on whether we’re celebrating the OF or EF, I’ve decided to leave them veiled until the Gloria is intoned at the Easter Vigil, in accordance with the desire of the Congregation for Divine Worship which in 1988 wrote in Paschale Solemnitatis section 57 that it is fitting to do this in the OF, too. OF Parishioner: Wow, Father, that’s really cool! I can’t believe I didn’t know this about my Catholic heritage. I am now inspired to learn Latin and serve Mass for you in the EF at the earliest opportunity, if you find me worthy. I will also pray that God call as many of our children as pleases Him to become priests and / or religious. Or something like that. One can dream . . . 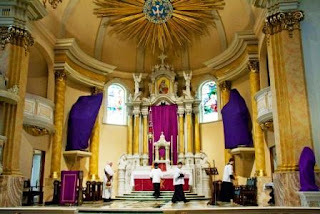 Trying to do this was interesting in my home parish where, when we had the TLM, it was only on one weeknight per week. The “novus ordinarian” (sorry, I just find the term amusing) practice was to cover the statues and images in red on Palm Sunday, which left us trying to scrounge to temporarily cover whatever we could on our one evening during Passion Week. We always managed to cover the crucifix on the altar, but I’m not sure we succeeded in meeting the requirements of the Missal…. We ran into the same issues with trying to scrounge three altar cloths, but that’s another story.